We have some questions regarding the Society and the news of the Society of St. Pius X and regarding its 500 priests. Recently you visited the seminary in Winona; is it an important seminary for the Society? The Society has 6 seminaries in the world, and, in the northern hemisphere, we have one in Germany, one in Switzerland, one in France—which is a part of Econe: it is the first year that we start in France and then we finish in Econe—and we have one here, in the United States... Mainly the English speaking candidates will come here. We try, from time to time to make a switch, to have some seminarians from other countries, to keep the international aspect of the Society, but mainly we will have North Americans who will come here, and definitely for them, it is very important to have this seminary. 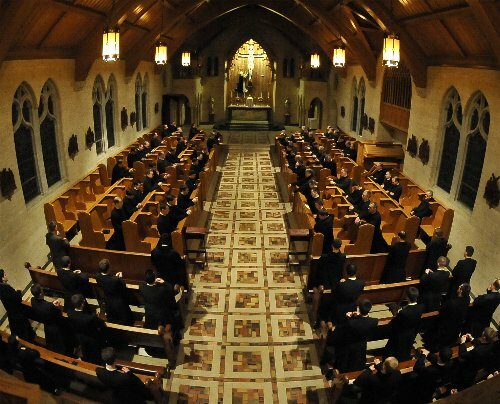 In regard to the seminarians, what is your impression of the quality of the youth coming to the seminary, these days? We have… good people…definitely, one who wants to give himself to the Lord, it’s already a good sign of good quality. They are, though, also touched by the weaknesses of the modern world, so we also see in the youth which is coming to us some deficiencies which need to be improved. That is why we are adding these years of Humanities; we try to give them general knowledge on… well, the humanities, the human being, before having them going on to the divine, I would say …they must be good men. Roughly speaking, many of those who come to the seminary have already gone through our schools, and in our schools they certainly do already receive a good formation—above the average, certainly—that we hope to increase nevertheless, all the time; but definitely we have good people there. 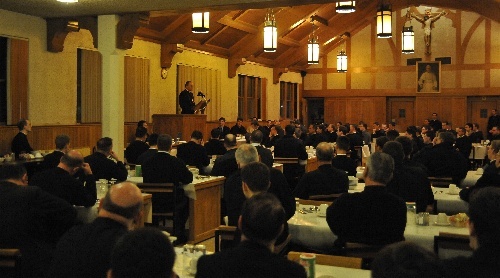 Speaking of the United States District, you recently attended the Priests’ Meeting. Are you proud of them? Oh, sure, we are very, very proud for our dear priests. They do a good work. It’s a hard work. One can with difficulty imagine the weight which is on the shoulders of the priest, or of the difficulties which he has to face, to help people to solve problems which are sometimes very, very difficult. And, so, yes, indeed, I am proud of our priests. While you have been in the United States, you visited a few of the chapels. What are some of the challenges of the American District? The American District is in a state of Diaspora; that means you have a lot of faithful, which are spread around, a lot… great territories for few priests. If you make the count, we are now about, let’s see, over 60 priests to cover the United States which makes not even 2 per state! And that means a lot of travelling, probably too much travelling, but we do what we can. What we see is an increase in depth, in quality, in the formation of the faithful when the priest is present. So where we have a priory…, we have a development of parish life, which is hard to achieve without the priest, who is like the engine which makes this life grow; and for the time being we don’t have enough priests to be able to have enough priories because in these priories we don’t have only one priest; we have at least two or three to have what we call “community life”. Our priests need communities to help them to maintain their priestly lives, their spiritual lives. They need that community. And so that makes it even more difficult to open a new priory because we need more priests for that… That this is a great, great challenge. Of course, we have the planes, we have these speedy ways of communicating… I must say though that this will never replace the real man, the priest. It helps, but it’s not the same.